The New Socialist Alternative (CWI-India) is a Socialist Political organisation striving to build an alternative mass political platform for the youth and the working people of India to end the present rotten Capitalist-Landlord system. As Internationalists our activity or outlook is not confined to artificial national boundaries created by the present ruling classes, but rests upon challenging capitalism globally and replacing it with a system based on democratic Socialism in the real sense of the term, where the organisation of production and running of the society is firmly in the hands of the working masses. By no means are we are stuck to a rigid political ideology. Rather than a top down approach, our ideas and methods are guided by discussions that are conducted in a thoroughly democratic framework and actions that are based on consensus with members of the organisation in particular and taking into account the wealth of experiences from the various working class struggles that are being waged around the country and globally. We are against all forms of violence, whether terrorism of the fundamentalist variety or the guerilla tactics of ‘Maoist’ variety. At the same time we are not pacifists. We believe any change in the existing order can only be brought about by the mass action of the working people and the other downtrodden and the oppressed sections of the society. New Socialist Alternative has other sister organisations, located in over 45 countries and in all continents, that form the Committee for a Workers’ International (CWI), which share the same principles and are solidly grounded on the experiences of the day to day struggle of the youth and the working people in the respective countries. What we Stand and Fight For? Living minimum wage, shorter working week without loss of pay and living wage pension. # Guaranteed Work for All! Which must ensure a decent LIFE. # Ceiling on the salaries of CEO’s and board members of Corporate companies. Open the books of the Profiteers! # Confiscate the assets of companies which blackmail workers and jeopardise the future of the community, or which have a record of causing environmental pollution. # Massive public spending increase on health, education, child care and housing. Slash the military spending! # No to displacement of people from land and livelihoods in the name of ‘development’. No to SEZs – Special Exploitation Zones! # Armed defence committees formed by Trade Unions, workers & people from all communities to protect minorities & vulnerable sections of the society! There are no rich backers or “invisible” funders to our struggle, we solely depend for all our activities from donations and financial contributions primarily from our members, supporters and sympathisers. We welcome every RUPEE that comes from our class of the ordinary struggling masses. And above all, for a successful struggle against capitalism, requires ideas, a political programme and an organisation that is able to unite the youth, workers and oppressed people across India. The New Socialist Alternative (CWI-India) aims to facilitate and build such a Mass Political Alternative of the working people and youth. This task needs people like you to join us in this struggle for Democratic Socialism. 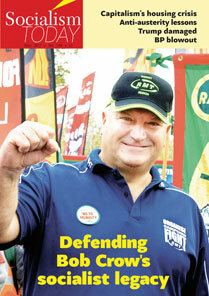 An excellent site, keep up the excellent work comrades, solidarity from a comrade in England. you are people are not suited for india and its unity…DAMN u and ur sponsors.